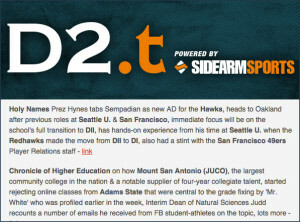 Building off the momentum generated by D1.ticker since January of 2013, collegiate administrators & those connected to the industry now have a curation service that will keep them up to date on developments specific to DII college athletics. Administrative hires, coaching changes, facilities, sponsorships, fund-raising, compliance issues, as well as general trends in social media, technology, new media, marketing, advertising & business operations will be included. Division II sports also has a distinctly different narrative than Division I, so personal interest stories, work-life balance entries & other division-specific topics will be a focus. D2.ticker is designed for speed & simplicity. One email every Monday, Wednesday & Friday morning with a curated selection of the most important fact-based developments in DII college athletics. Key for those who want to gain an advantage with their knowledge base, while also freeing more time to excel in their individual roles. Subscription is free, thanks to industry-leader Sidearm Sports. Subscribe now and enjoy your effective time savings without missing a beat.